I've got some exciting news! I've been chosen to participate in the Castine Plein Air Festival on July 27th, in Castine Maine. I'm very excited about this. 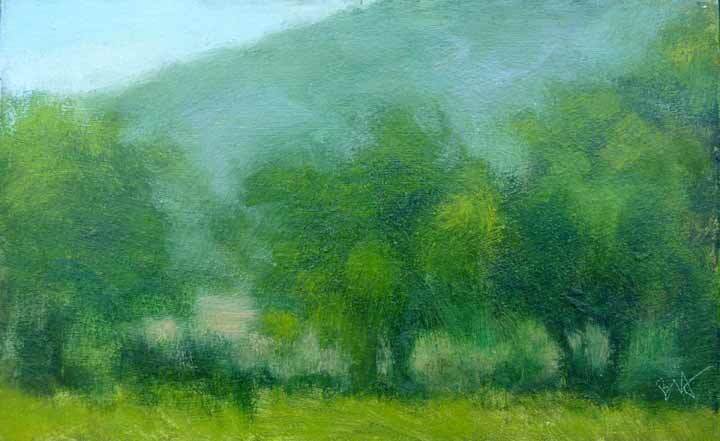 Having done the Laudholm Farm Wet Paint Auction in Wells several times, I've been looking to participate in one of the plein air events that are becoming popular. This one looks like a lot of fun. 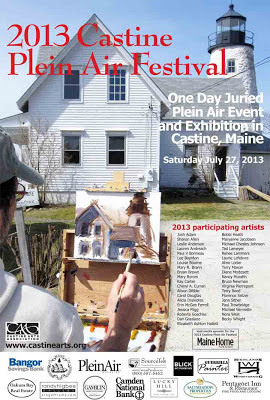 If you are going to be anywhere near Castine in late July, please do stop by, we've got some great painters participating. And Castine is a very pretty Maine seacoast town, and home of the Maine Maritime Academy. Julian gave us a lesson in painting trees, focusing on giving them some variety and a shape other than that of a lollipop on a stick. Isn't it interesting how the longer you work on a painting the more regular and evenly spaced everything becomes, even when you started out with lots of variety and interesting shapes? We have to fight against that. I think I succeeded here. Thank you, Julian.